After a breakout 2011 season that saw him win 13 games, the future looked bright for over-achiever Dillon Gee. And, Gee built on that promise with even better performance in the first half of 2012, but unfortunately, the season ended with more questions than answers. Despite a few rough outings to begin the year, all signs were pointing up through Gee’s the first 17 starts of 2012. He was on pace to pitch between 180 and 200 innings — a marked uptick from the 160 spun in ’11 — significantly cut down his walk rate from 4.0 to 2.6 per 9 innings, and improved his strikeout rate from 6.4 to 8.0 /9. But everything came to a halt when Gee experienced tingling in his fingers and a blood clot was discovered in the artery in his right shoulder in July. Surgery was performed and he was shut down for the rest of the year. Sadly, it wasn’t the worst news Gee received all year; his 30-year-old brother Jared was diagnosed with leukemia in late March. According to all sources, the surgery to remove the blood clot went well, and there’s every indication that Gee will resume pitching come February (if not sooner). It’s assumed that the surgery and recovery process will have no effect on his ability to pitch — but we won’t know for sure until Gee steps on a mound. From a positive perspective, this issue does have precedent: David Cone experienced a similar, though much more serious and extensive surgery back in 1996, and he made a complete recovery back to health and pitching prowess. For all we know, the setback could be a blessing in disguise. 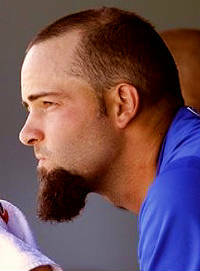 Gee has been pitching with a frayed labrum since 2009; maybe the time off has given that injury an opportunity to heal. How’s that for thinking positively? Considering the amount of adversity piled on to Gee’s back in his life, and what he’s accomplished in spite of it, positive thoughts are all I muster for this tenacious young man. If Gee can come back with the same health as he started 2012, he will slot in to the back of the Mets starting rotation. Based on what we saw in 2011 and the first half of last year, Gee should be a very reliable, above-average #5 starter — one of the better #5s in the NL. Let’s hope he can come all the way back and assume that role. If you look at Gee’s pitch values on FanGraphs, his changeup was great (no surprise), his other secondary stuff was good (slight pleasant surprise for me), and his fastball got murdered (big surprise). I found the fastball results surprising because what I saw with my eyes surpassed the book on Gee’s stuff: velocity that topped 90 just as often as not, significant running action, and even a bit of late hop upstairs. His command with it, though, was less impressive, and that’s probably the reason for all those HRs (the biggest downside of his stat line). Maybe in airing it out more, he’s lost some precision. If it makes his secondary stuff play up, though, it may be worth it. Best case scenario: Dillon keeps throwing 90, but learns how to spot it without losing velocity. That’d elevate him from “good back-end pitcher” to “good pitcher, period”. I also find Gee’s pitch selection the most fascinating on the Mets; some days, it’ll be a masterful mix-and-match, and other days, it’s just fastball low-and-away, fastball low-and-away. Oops, my pitch value info was out of date. As the season wore on, his fastball improved and his curve got worse. Stats here.